For the longest time I thought I wasn’t much of a chocolate lover, and I’m fairly certain that I’ve proclaimed my fondness for fruity, sour, chewy candy-awesomeness more times than I can count. However, within the last couple of years I’ve strayed a little bit from the sweets of my youth and tiptoed my way to the dark side. And now, I am completely smitten. When the lovely people at NESTLÉ® asked if I would be interested in collaborating with them to create a delectable recipe using NESTLÉ® Toll House Dark Chocolate Morsels, I couldn’t resist. Plus, the idea of a fun “Dark Chocolate Pinspirations Contest” is something this Pinterest fanatic can easily get behind! When deciding what to create for this collaboration, I knew keeping it simple would allow the rich, intense flavor of NESTLÉ®’s dark chocolate shine through. What better way to make that happen than decadent Dark Chocolate Toffee Truffles? Come on, who doesn’t love a marriage between rich dark chocolate and rich buttery toffee? I can’t be the only one that secretly consumes those little toffee bits by the handful when making recipes that include them… right? Smooth and sinful, these Dark Chocolate Toffee Truffles are a treat worthy of your deepest chocolate needs. And thanks to NESTLÉ® Toll House Dark Chocolate Morsels, they’re easy peasy to make. Trust me, you’re going to want to make these babies, stat. 1. Place chocolate morsels into a medium bowl. In a small saucepan, bring heavy cream to a boil. Remove hot cream from heat and pour it over chocolate. Let stand for 1 minute, then stir until chocolate is melted and mixture is smooth. Stir in vanilla extract and chopped toffee bits. Cover and chill until firm, about 2 hours. 2. Line a rimmed baking sheet with parchment paper. Using a small cookie scoop, shape mixture into 1-inch balls. Roll truffles between your palms to create a smooth appearance. 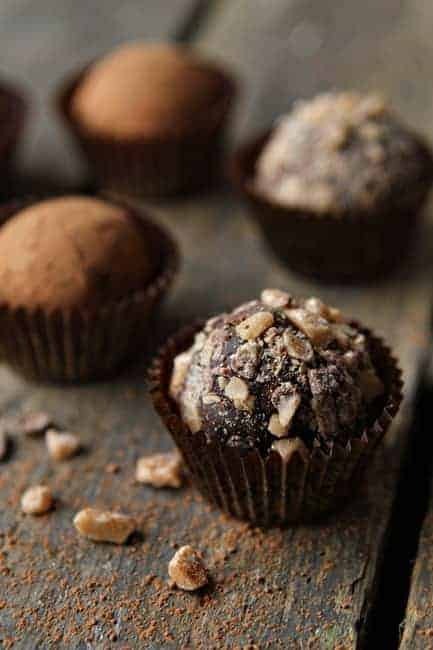 If desired, roll truffles in cocoa powder or additional toffee bits. Chill until ready to serve. - Truffles can be made up to one day in advance; store truffles in an airtight container within the refrigerator. - Toffee bits can be found in the baking aisle of the grocery store. However, you can also simply chop up your favorite chocolate covered toffee candy bar. Hi Jamie! I’m participating in this too, but my link won’t work to the actual Nestle page for pinning. Aren’t the pins supposed to go to their page? Have any insight? And re-pinned it! Love love your blog. These look so tasty!! Yum! Pinned! These look amazing… I need to pick up some Nestle Dark Chocolate and try your recipe! I want these. Ole loves dark chocolate and toffee, but toffee is generally paired with milk chocolate. This is perfection. Done!!! These look so yummy. Love this! Repinned and liked! Good luck! You are definitely not the only one eating those little toffee bits straight out of the bag! I always have a few bags on hand JUST in case I have a Toffee Bit Attack! I love dark chocolate…and these look simple to make. And not to mention divine! I re-pinned it…good luck! How could you not be a chocolate lover…especially after you created these decadent treats! Thank you for allowing us all to enjoy! These have definitely been added to my ‘to make’ list. They would make a lovely gift for someone (and for me)! I’m not usually a fan of plain dark chocolate but this mixture looks great. Good luck in the contest! I’m loving this! I can’t wait to make these! I will be making these soon! They look superb. Do you think 85-90% dark chocolate bars would work well for these, or would that be too intense? If you like dark chocolate, then I think that would be fine. Can find anywhere that sells the dark chocolate morsels in the UK? Are there any goof replacements or does anyone know where I can buy them? You might try Amazon or another online baking source. I hope this helps. Sure! That will work just fine. This recipe looks fantastic – but the blog is covered with ads for U by Kotex Sleek Tampons. Really, like 6 on just this page. Kind of distracting when one is reading a yummy recipe! Yikes! We’ll look into it. Thanks so much for letting me know.